Texas Do It Yourself Builder Creates Net Zero Home with Faswall - ShelterWorks Ltd. 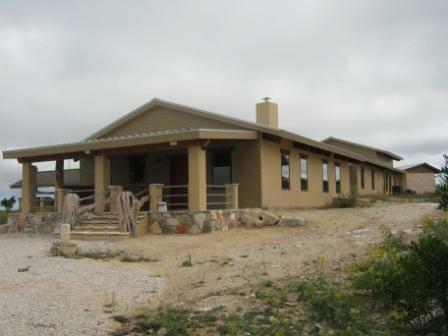 In rural Texas, a homeowner and professional builder teamed up to build a net zero, passive solar home using Faswall green building blocks. Faswall’s ICF wall forms met all the owner’s requirements for ease of use, energy efficiency and durability. In addition, he and the builder were able to use them to create a beautiful structure that compliments a stunning hill country location. When homeowner Ralph started preparing to build a home on the Real County property he owned, he had several goals. They included creating a structure that was sustainable, could hold up to the area’s strong winds and harsh conditions, and allowed him to live off the grid for some period of time. He also wanted to participate in the home building process, even though he didn’t have much construction experience. Ralph and Ron, a professional home builder who helped with the project, agreed that Faswall green building blocks were the perfect building material. The blocks are easy enough for even a DIY home builder to use because they are dry stacked and do not require mortar. “We were already familiar with dry stacking … so it wasn’t a big jump for us,” says Ralph. Ralph and Ron worked together to stack the Faswall green building blocks into four-foot high walls. At that point, they poured in concrete to hold the blocks together and provide the structural strength needed for the wall system to support the roof and overall engineering requirements of the building. “We felt that was the safest,” Ron says. “Once you start stacking block again four feet of your wall is very stable.” The repeated this process two more times to build 12-foot high walls. Most people hire a pumper truck or line pump to fill the Faswall blocks. It would have been too expensive to hire the equipment, Ralph explains, and he’s not even certain the heavy piece of equipment would have been allowed to travel the rural roads to his property. As a result, he and Ron hand-poured all the concrete into the Faswall blocks. We applaud this amazing effort! The house was sited to take advantage of the passive solar potential of the building site. “Heating is not our major issue here, cooling is, but we designed it so it has cross-ventilation” from the strong winds that blow through the area, Ralph says. Overhangs block the sun during the hottest months but let some of it in during cooler periods. The home is set back from the top of the hill because Ron didn’t want to affect other people’s views of the surrounding hills and mountains. Ralph’s new home was completed in the summer of 2013. He and his family are very happy with the results. “With the Faswall block it’s extremely comfortable. The Faswall section of the house in the winter is extremely warm. We have a stove in there, I hope it gets cold enough for us to use it. The Faswall block does a wonderful job of retaining the heat.” Faswall’s exceptional energy efficient properties are owed to its unique wood fiber cement composite as well as the 3 inches of inserted insulation on the inside of each block cell. The walls have unrivaled thermal mass properties that help keep buildings cool in the summer and warm in the winter. For more on Ralph and Ron’s take on the value of Faswall green building blocks, watch this video. For more on how you can get similar results in your home, office, commercial building, foundation, outbuilding or other structure, please contact us. Categories: Faswall for Do-It-Yourselfers, High Performance Walls, Net-zero-home Leave a comment ?